HMD Global, the home of Nokia phones, continues to rapidly renew its portfolio of Nokia Android smartphones by today launching Nokia 3.1 in India. Offering access to the latest Google services, such as the Google Assistant, the smartphone continues to deliver a pure, secure and up-to-date Android experience with Android One, combined with the premium craftsmanship and design expected from a Nokia smartphone and the performance to match. 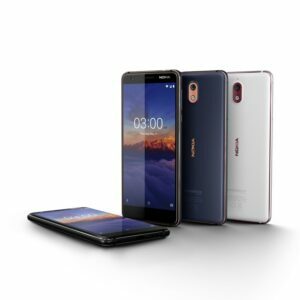 Nokia 3.1 goes on sale starting July 21st across India and will be available across top mobile retailers and online on Paytm Mall and Nokia.com/phones. Consumers buying Nokia 3.1 from a retail outlet by scanning the Paytm Mall QR code will get 10% cashback on recharges and bill payments on Paytm. Consumers buying Nokia 3.1 will additionally get two INR 250 movie cashback vouchers which can be redeemed against booking minimum two movie tickets via Paytm. Consumers using ICICI Bank Credit or Debit Card will get a 5% cashback. Idea and Vodafone consumers will get two exciting offers. On a recharge of INR 149 pack, they will get 1GB data/day, unlimited calls and 100 SMS/day for 28 days; additionally, consumers upgrading from 2G or 3G phone to the new Nokia 3.1 will get 1GB data/day for 28 days. On a recharge of INR 595, consumers will get unlimited calls, 100 SMS/day, 18GB data for 6 months.